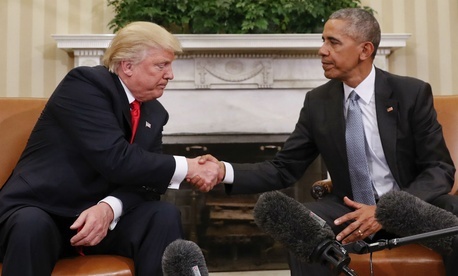 How Far Behind is Donald Trump's Presidential Transition Compared to Obama's? Donald Trump disputes claims that his presidential transition is in disarray, blaming leaks from job-seekers for a creating a false picture. But we don’t need to look at what anonymous sources are saying to see that the transition is falling behind. We can compare Trump’s efforts to what Barack Obama did when he came into office in 2008. It’s fair to note that Obama came into office during a time of national crisis, and his team worked furiously with the Bush administration to deliver perhaps the most professional transition in US history, reassuring Americans (and financial markets) that everything would be ok. Yet one might expect that in a time of relative tranquility, the transition could proceed more quickly, especially with the benefit of a 2010 law that increased funding and other resources for presidential transition teams. 2008: The day after the election, the Obama-Biden transition project announce their entire team, including three co-chairs, a twelve-member advisory board, and thirteen staffers, largely drawn from long-time congressional and executive branch Democratic staffers and government officials. The team notes that anyone who lobbied on an issue in the past 12 months could not work on it. They begin vetting potential appointees to office. 2016: Trump does not make any official announcement. 2008: Obama meets with his economic advisory team and announces his White House chief of staff would be Rep. Rahm Emmanuel. 2016: Trump goes to Washington, where he meets with Obama in the Oval office to discuss the transition. 2008: Obama holds his first post-election press conference; these were more innocent times, when an unfortunate joke about Nancy Reagan holding seances in the White House required an apology from the president-elect. 2016: Trump has yet to hold a single press conference with reporters since his election. But there’s action today: Scandal-tainted New Jersey Governor Chris Christie is ousted from his job leading the transition, and the duties are handed over to Vice President-elect Mike Pence. Trump also announces his transition advisory board, which includes three of his children and his son-in-law, and an eight-person staff. 2016: Trump spends Sunday tweeting, then announces Stephen Bannon, the former publisher of the right-wing website Breitbart, and Reince Priebus, current chairman of the Republican party, will be his top adviser and chief of staff, respectively. 2008: Obama meets with President Bush in the Oval office to discuss the transition. His transition team members begin meeting with the executive branch staffers on an agency level to put the transition in place. 2016: Pence signs a memorandum of understanding that is needed to begin the legal transition process; the document had previously been signed by Christie and was made invalid when he was removed from his position. Trump meets with advisers at his home. 2008: Obama announces his agency review leaders, and the specific teams of staffers who will review policies and appointments for the Departments of State, Treasury, and Defense. 2016: Executive branch officials say they are waiting for news of the Trump transition’s agency review teams. 2008: Obama adviser Valerie Jarrett records a video message to the public about Obama’s transition team and ethics rules. 2016: An anonymous Trump spokesperson tells Boston Globe reporter Matt Viser that the agency review teams are being launched. No official announcements about who will be on them have been made. In all, Trump’s team is several days behind the Obama effort in terms of getting staffers in position to assess how they will make policy and who they will need to do it. But the major difference is transparency: We knew in some detail who was working on Obama’s transition team, and the 2008 president-elect and his advisers made themselves available to the press; we’re still not sure who is handling the details of Trump’s transition and what their philosophy is. The real test to show whether or not they are far behind will be when the behind-the-scenes work comes to fruition. The Partnership for Public Service says that a president should have launched agency review teams in early November, a missed opportunity for the Trump administration now. In the Partnership’s ideal transition timeline, the president picks his top 50 appointees (cabinet and agency heads, as well as White House staff) before Thanksgiving. At this point, that seems unlikely for the Trump team. Obama began announcing his cabinet picks in the days before Thanksgiving, rolling out his economic team, including Secretary of Treasury, budget director, the heads of the National Economic Council, the Council of Economic Advisers, and the White House domestic policy council. The bulk of his major national security appointments were announced on December 1, with other top nominees rolled out in the ensuing months.